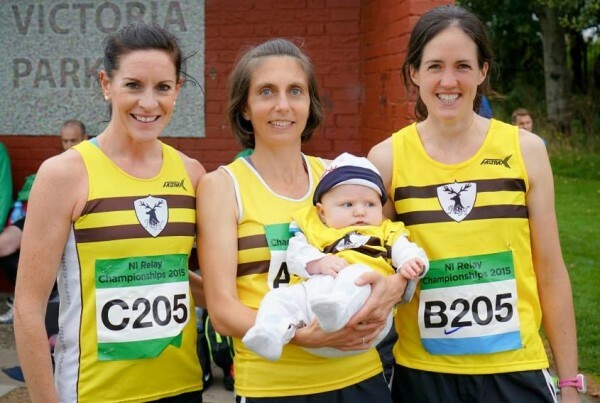 Gladys Ganiel (center) holds her son Ronan after she and teammates Breege Connolly (left) and Martsie Hell competed in the Northern Ireland road relays in October 2015 at Victoria Park in Belfast, Northern Ireland. Maine native Gladys Ganiel is shown competing in the marathon at the Commonwealth Games in July 2014 in Glasgow, Scotland. The Narraguagus High School and Providence College graduate now lives and works in Belfast, Northern Ireland. 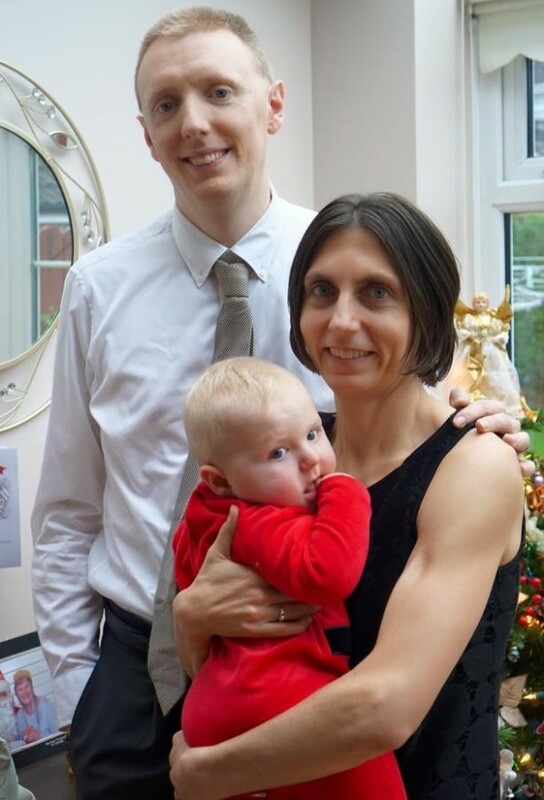 Brian O'Neill and Gladys Ganiel, with son Ronan, pose for a Christmas photo in December 2015 in Belfast, Northern Ireland. Gladys Ganiel did her best to keep track of her alma mater’s girls basketball team as Narraguagus High School of Harrington won the Class C state championship in February. “Heather [Thompson], the coach, is my cousin so I followed everything on Facebook,” said Ganiel, who as a high school freshman helped the Knights reach the 1992 Eastern Maine final. But while modern technology easily bridges the high seas, a more traditional rite of adulthood prevented Ganiel from taking full advantage of the opportunity to observe Narraguagus from her home across the Atlantic Ocean in Belfast, Northern Ireland. “You theoretically could watch the games on the Internet, but I had to go to sleep because of my child,” she said. Ganiel and her husband, Brian O’Neill, became parents to a son, Ronan, last May 26, and in the aftermath of that event have experienced the sleep deprivation that comes with welcoming a new life into the world. But it hasn’t stopped the 39-year-old Ganiel from continuing another lifelong passion: Distance running, specifically her bid to qualify for Ireland’s 2016 Olympic women’s marathon team. The former Narraguagus and Providence College standout, a dual U.S.-Irish citizen, is one of five Irish runners to achieve the qualifying standard of 2 hours, 45 minutes. Ganiel ran a personal-best 2:38:47 at Seville, Spain, in February — less than nine months after giving birth. Ganiel’s clocking at Seville is the fourth-fastest time among the Irish contingent vying for three Olympic berths. But one runner ahead of her, Fionnuala McCormack, may instead compete at 10,000 meters in Rio, and additional criteria could enable Ganiel to make the Olympic trip to Rio de Janeiro, Brazil, in August. Ganiel moved to Ireland to pursue her master’s and doctoral degrees after graduating in 1999 from Providence, where as a freshman she was part of an NCAA Division I championship cross country team and as a senior won the Walter Byers Award as the NCAA’s top female student-athlete. She took several years off from competitive running to focus on her education, but in recent years Ganiel has been active in the local running scene as a member of the North Belfast Harriers while working as a research fellow and university lecturer focusing on the role of religion in conflict, currently at a location named for a fellow Mainer, the Sen. George J. Mitchell Institute for Global Peace, Security and Justice at Queen’s University in Belfast. 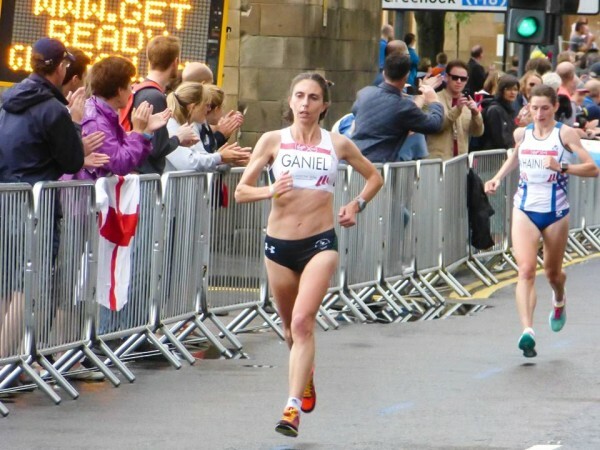 Ganiel realized a goal of running in an international competition in July 2014, when she placed 12th in the marathon at the Commonwealth Games in Glasgow, Scotland. She learned of her pregnancy two months later, curtailing her training regimen but leaving open a timetable for a return to running in time to challenge for a 2016 Olympic berth. Childbirth went smoothly, and soon Ganiel was back on the road with her son and the Olympic qualifying standard on her mind. “Once you get to 16 weeks out from a marathon you have to be running at a decent level,” Ganiel said. “I had worked up to maybe 60 miles a week about 16 weeks out from Seville, and I also was doing pilates and strength and conditioning work. While Ganiel had run as fast as 2:39:26 at the 2013 Berlin Marathon, there was some uncertainty as she approached Seville. But not to worry, as Ganiel eclipsed her previous personal best by nearly 40 seconds to place 13th overall among women finishers at Seville — though she did come up 78 seconds short of having one of the top three Irish Olympic qualifying times. American women marathoners must achieve the 2:45 qualifying standard to race in the U.S. Olympic Trials, then the top three finishers in that race qualify for the Summer Games. In Ireland, any marathoner who achieves that qualifying standard may be considered for its Olympic team. “But they might not take it just on time because we’ve all run different courses and some courses are faster than others,” Ganiel said. Then there’s the issue of when the runners run their qualifying time. Irish runners may qualify for the 2016 Olympics during any of three performance windows: Jan. 2015-Nov. 2015, Dec. 2015-March 2016 and April-May 2016. “Theoretically if you’ve run your marathon in the first two performance windows you should be looked on more favorably than the girls who are going to be trying to go for their times this April or May,” Ganiel said, referring to the additional recovery time available before focusing on the Olympic race in August. The three runners with faster times than Ganiel, Lizzie Lee (2:32:51), McCormack (2:33:15) and Breege Connolly (2:37:29) all qualified for consideration in 2015. Now comes a busy spring marathon season in Europe for runners to better existing times or achieve the qualifying standard for the first time. Hopefuls also use April and May to reflect another Irish criterion — good current form. “So even if you got the time you have to show you’re in good shape, so basically in April and May all the girls have to show we’re progressing to run a fast marathon in August,” said Ganiel, who plans to run a half-marathon in Leiden, Netherlands, on May 22, the day before the Irish team is selected. McCormack’s quest to qualify at 10,000 meters isn’t the only other factor that might affect Ganiel’s chances. At least one other Irish runner, Maria McCambridge — a former teammate of Ganiel at Providence — likely will attempt to get her time at the Vienna (Austria) Marathon in mid-April after being sidelined by injury for much of 2015. “She’s a really good athlete, easily a better athlete than me, and she’s running in April and you wouldn’t be upset if she was selected ahead of you because she has a (personal best) of 2:34 and my PB is 2:38,” Ganiel said. “That’s one reason a small country like Ireland has sort of ambiguous criteria, in case one of its really top athletes does get injured early on.